Ask fellow campers about "Emma Long Metropolitan Park" and nearby attractions. This two night (Thu / Fri) stay was far above our expectations, based on other reviews, perhaps because it was the first week of March. While the other paved campsites were full, there were no day users, so the park was very quiet. Lots of grass around the very wide sites and down to the lake. Our 24' Class B+ just fit into Site 10. There was one Class A on another site, but this is not a place for "big rigs", both because of the site size and the hilly, twisting access road. The dump station is marked, but the opening is just a metal plate on the asphalt, not the typical foot-operated cap. And, there was no wash down hose. We are boaters, so watching the occasional pontoon or ski boat drive by was a plus. The gate was not locked during our stay. We camped at Emma Long Metropolitan Park in a Motorhome. The County Line On The Lake BBQ restaurant, with a large covered dog-friendly porch right on water, is within a few miles. We did not have time to hike the popular Turkey Creek trail, but will do so if we return. When we left on Saturday morning, the parking lot for the trail was full, but almost empty on the two previous days. We drove through this park on a Saturday. There is another comment that they can accommodate a 40 ft rig. We never saw one that could accommodate anything larger than a 30 ft trailer if that. Although the price is good for the area, I cannot recommend this park unless you are ready for many people, lots of noise and very crowded conditions. We would not consider returning to this park. It is also quite a distance outside the main part of the city and not really handy for doing the tourist thing. We camped at Emma Long Metropolitan Park in a Motorhome. Nice, trees, grass with paved sites, but old. No pull throughs. Rate was for a lakefront site, non-lakefront (50 feet from the lake) was $20. Plus there is a $5 vehicle fee. TV reception was excellent. No Wi-Fi but our Verizon cell and broadband worked well. Quiet except for the invasion of boats Sat AM. We didn't stay on Sunday. Park gates close and are locked from 10PM to 7AM so don't plan on staying outside the park too late,or getting an early start! Twenty minutes or so to central Austin. We will return to take in more of what Austin has to offer. We camped at Emma Long Metropolitan Park in a Travel Trailer. Great City park with 20 RV sites with water & 50/30/15 amp pedestals, and another 46 tent sites. Roads & Parking Spots are asphalt. Parking Spots are wide, but not real long. All are back-in. Tight Roads, but do-able. Entrance road has lots of hills and curves and is 2-lane. Roads could use some maintenance. Our site was right on the water at Lake Austin. We like staying there, just wish it was easier to get into. All sites are first come, first serve and there is an extra vehicle charge, $5 M-T, $8 F-S & Holidays. Get in mid-week & you should not have a problem getting a site. Check the sites before you pay to be sure you can fit if you are in a diesel pusher. 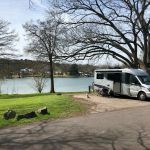 We camped at Emma Long Metropolitan Park in a Motorhome. What a nice municipal park, right on the lake. I was there for longer than the 14 day limit - though I had to move to an adjacent site, but hey, I needed to dump tanks anyway so had to drive to dump station. I parked parallel to road vs perpendicular which allowed me to "pull thru" to both sites. I had seen someone else do it. The drive to the main road was a good 6-7 miles, then several to many miles to town. At times I was the only camper there, but it was late in year. Thanksgiving Friday to X-mas week. Staff member was initially hard-nosed about the 14 day limit, but relented when I was the only paying customer. Was forced to scale down to reduce expenses is why I chose it in first place. Can imagine how busy this place is in Spring or Summer. Monster picnic and tent area. The washrooms were just a notch above primitive but clean. Might very well stay here again sometime when not on a forced vacation. My PC's air card worked very well and was able to point the sat dish thru the trees enough to have that. Like I said, what a nice municipal park. Both my sites the 50 amp worked. We camped at Emma Long Metropolitan Park in a Fifth Wheel. The nightly rate does not include a one-time $5 entry fee which we only had to pay once for 3 days. 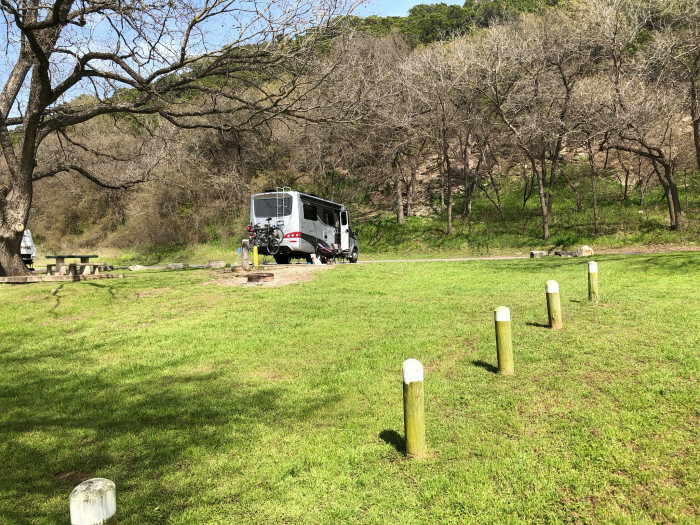 This campground is very convenient for visiting some friends in town, and would make a good place to generally visit Austin. However, while there are an absolute ton of non-electric tent sites, there were only 20 or so RV sites (water and electric), and they were about 60% used up (all lake front sites were used) by Thanksgiving day (compared with maybe 5 non-electric sites used in this park, and only about 20% occupancy of all other campgrounds in this trip). So this is a pretty popular, first-come first-served park. The popularity can give you some noisy camping neighbors unfortunately, which is why this gets a lower rating than other parks. Upkeep can use some work also; the lack of lids on trashcans means that trash was spread out all over the place in the mornings by hungry critters. 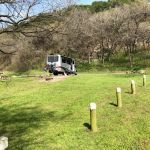 We camped at Emma Long Metropolitan Park in a Motorhome. Nice holiday park owned by the county. Very large city park on the lake. NO RESERVATIONS! 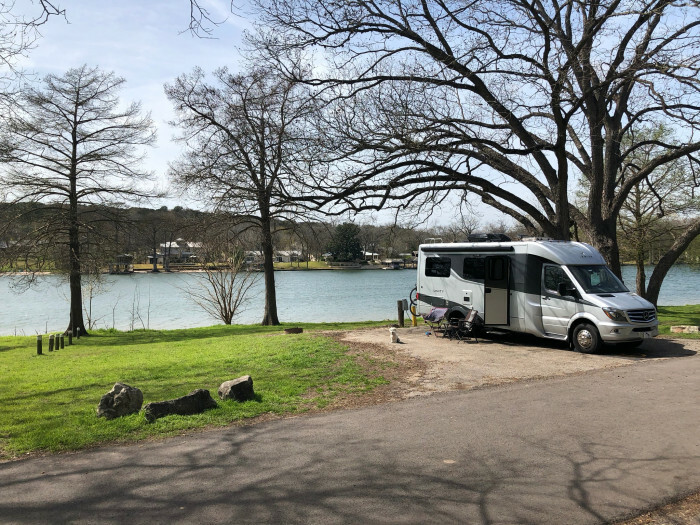 We camped at Emma Long Metropolitan Park in a Fifth Wheel. Are you affiliated with Emma Long Metropolitan Park ?